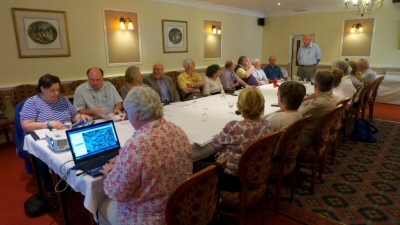 The UK mini-gatherings in between the formal conferences are becoming a real must for Shute enthusiasts and this year 17 souls arrived at the Lord Hill Hotel in Shrewsbury on Friday evening and 5 more joined on the Saturday morning. 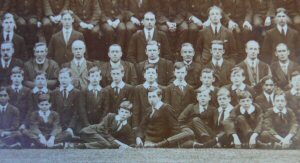 Shute attended Shrewsbury school between 1913 and 1916 and the attraction of visiting this scene of a less than well documented part of his life was clearly irresistible. As the aficionados assembled experiences since York last year were swapped, anecdotes related and the tale of an 8 pound lobster named Mike who has been saved from culinary execution by Laura held everyone spellbound. We await with eager anticipation the news that he has arrived in his new home at the �Lobster Lounge�. This was a case of an extraordinary lobster doing ordinary things, quite a twist on the usual Shute theme. A fine dinner was consumed in the hotel over which the conversation was continued at a discrete level lest we interfered with the 18th Birthday party next door. Only later did we realise that a 40th party was being held in another part of the hotel. Realising that we were quite inadequate to compete with this we happily retired to bed. Saturday morning dawned bright with the promise of an interesting day. In a meeting room in the hotel John Anderson outlined the plan for the weekend and then updated us on the latest research. 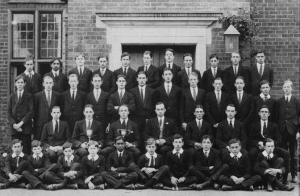 From Shrewsbury school he had obtained an article from the school newsletter on the Easter uprising in Ireland, written by a Shrewsbury boy on the scene. (Click here to see a transcript of this article.) It seems highly likely that this is the first example of the young Nevil Shute Norway "publishing" his work. Certainly the style and tone was reminiscent of his later efforts. 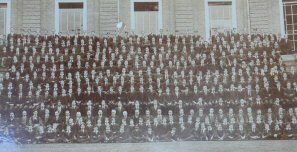 Another recent discovery was that Shute had financed the publication of a book by his old housemaster at Shrewsbury, Basil Oldham. By an amazing coincidence Jim MacDougald in the USA had acquired the copy of this book that had been sent to Shute and inscribed to him by its author. John had asked if he could send a picture, but Jim generously sent the book itself with instructions to give it to the school. Laura then gave an update on the plans for next year�s conference in Seattle with illustrations from Google earth and pictures of relevant places and an 8 pound lobster called Mike. The latter has nothing to do with Seattle of course. Seattle hotels are apparently fighting over getting our business and Laura is holding a competition based on the quality of scones they can produce. The Seattle area boasts many attractions, both Shute related and otherwise and Laura advises that, if at all possible, we should extend our stay to take in all that it offers. A web site with details of the event will be published (if that is what you do with a web site) shortly. Apart from the Shute connections associated with books such as Trustee, On the Beach and Requiem for a Wren the area is also heavily connected with the series "Twin Peaks". With a foretaste of the organisational excellence to come Laura produced emergency chocolates to go with our "damn fine" cups of coffee, although the cherry pie was absent. 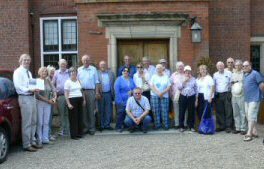 After lunch we travelled by coach to Shrewsbury school which is situated in a lovely location perched on a rise above the River Severn. Passing a statue to Darwin (an old Salopian) we met up with Dr Mike Morrogh who is Head of History, part time archivist and also a Shute enthusiast. 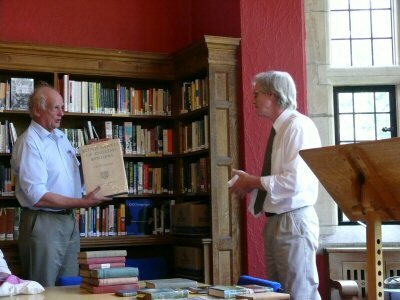 After claiming that references to Shute in the school archives were fairly limited he went on to give us a wonderful talk on the style of life that Shute would have experienced there. 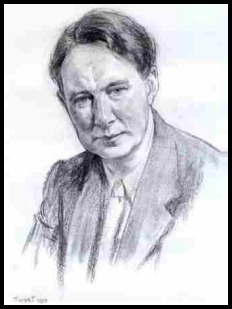 He had also assembled a collection of items including photographs and inscribed copies of Shute novels. Nevil Norway is in the middle of the front row. 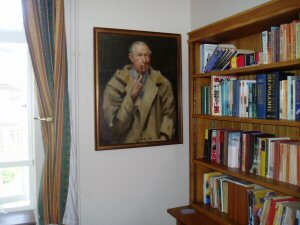 He discussed at some length the character of Basil Oldham and how Shute had provided funding, not only for the publication of his book, but for a local account to pay for holidays and whisky. From the detail given Basil Oldham is clearly the model for Mr Scarlett in Most Secret. Unfortunately John had unwittingly pre-empted Dr Morrogh�s "scoop" of the article on the Easter Rising, however this was mitigated somewhat by the presentation to him of the inscribed book from Jim MacDougald. Dr Morrogh then gave us a brief tour of the points of interest at the school including the boat house from which Shute would have conducted his rowing. He would have taken part in �bumping� races, which in his day would have involved precisely what the name suggests. However health and safety apparently now prevents actual contact and the act of bumping has to be indicated by a master calling through a megaphone while cycling next to the river ! A visit to Oldham�s House where Shute stayed during his time at Shrewsbury revealed a portrait of Shute on a wall. The picture is familiar to many as Dan Telfair has the same in his home and much debate was had on which is the original. We returned to the school in the evening for our formal meal in the Peterson room. After Pimms on the terrace we indulged in good food and fine wine amongst excellent company, I am sure Shute would have approved. For Sunday we travelled to the nearby RAF Museum at Cosford. This includes the National Cold War Exhibition that was opened about three years ago along with a wide variety of aeroplanes. In particular it houses a collection of experimental planes showing the extent of the British aerospace efforts in the post war years. The national Cold War Exhibition has yet more planes along with tanks and other artefacts from that period. Displays cover many facets of life including art and literature and included is a copy of On the Beach as an example of a story of the time. Around lunchtime and after the members dispersed and made their way home. It only remains to offer sincere thanks yet again to John Anderson for a superb weekend that can only be described as apparently Basil Oldham and Charles Simon would have said � Topping!